So there I was, staring at those 2 cans of artichoke one jar of marinated artichoke hearts I’d purchased in the hopes of dressing up a salad or 2 when we had company for shabbos few weeks ago. Sadly for all my culinary plans that weekend they called the morning they were to arrive to say that their sump pump choose the night before to give up the ghost and flood their basements. I put these gourmet treat back in the pantry because well, they were kinda expensive, my family don’t love them they way I do so I tend to save them to fancy up the meals when company comes for yontif of shabbos. I considered them a form of delayed culinary gratification. So back to me staring at the cans this morning. I said to myself, self, why are you saving these for company. You love them, why not? And of course, it was right to my recipe file and I was off and cooking. 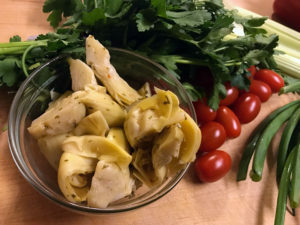 Hopefully you too will find a can or three of artichoke hearts in your pantry or on sale at your favorite grocery and are able to try the following recipes and find them as delicious as I do. 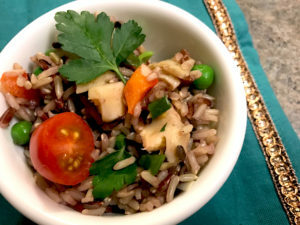 Place the rice in a bowl and stir the Italian dressing into the rice. Add the remaining ingredients into the bowl and mix to combine. Cover with plastic wrap, refrigerate for at least 4 hour or overnight, Serves 8 to 10. *You can use the left over marinade to marinate sliced mushrooms, sliced onions and cucumbers. Combine all the ingredients in a large bowl and mix to combine. Don’t worry about how much liquid you use; the mushrooms tend to soak up most of the liquid. Cover and refrigerate for at least 4 hours or overnight. To serve line a plate or serving platter with red leaf or Bibb lettuce and place the salad on top. Serves 6 to 8.